How you got involved in your sport: I saw rowing on TV and saw kids walking around town with rowing jackets on and I really wanted one. Essentially I got into rowing because I wanted the jacket! Also, I watched as the Canadian Men’s Eight won gold in 1992 and saw a little guy (Terry Paul) jump up into the arms of the rower directly in front of him (Derek Porter). I thought “I’m small, I could do that”. 16yrs later I did the exact same thing jumping into the arms of Kyle Hamilton! The moment you knew you wanted to represent Canada: Watching the Calgary ’88 Olympics and falling in love with the rings. 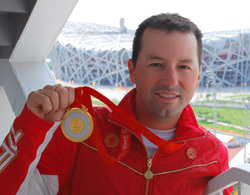 I wanted to represent Canada I just never knew how until I found rowing and realized I was really good at it. The ’88 games sealed it for me. That is why the 2010 games are so awesome! A whole new batch of kids fell in love with the dream! 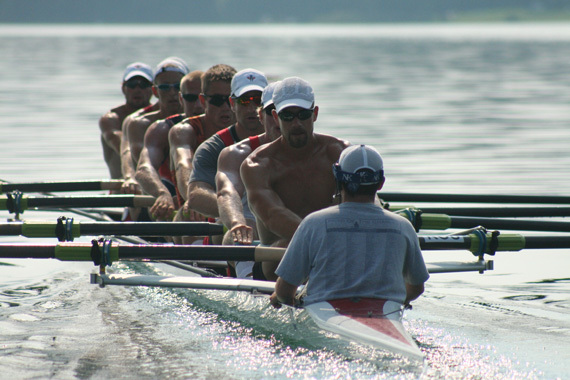 CAN Fund Testimonial: Being a long time National Rowing Team member and multiple CAN Fund recipient, this Fund has literally extended my rowing career into my 30’s. Without their support my days competing and winning internationally while supporting a young family would be extremely difficult. Fun Facts: I have 2 daughters. Brianna, 4 (named after me) and Peyton 1.5. My wife Robbi is an RMT….no I do not get massages every day. I feel guilty asking since she has been at work doing that all day. As a kid I attained the highest award in Boy Scouts, the Chief Scout Award.